practice | meeting myself on the mat, every day, in search of love, truth & beauty.... will you join me? 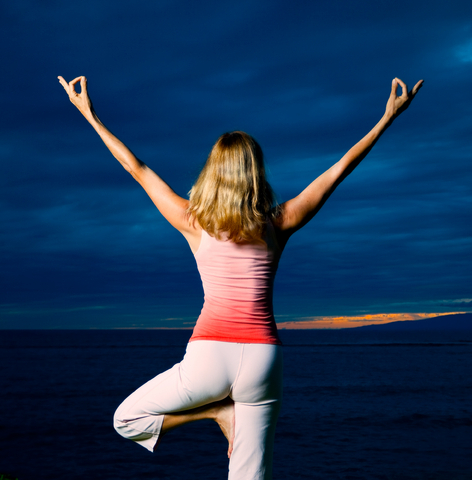 The four principles of balance are Vision, Grounding, Support & Centering. In yoga pose, we apply these principles intuitively. Vision starts literally where your eyes fall – your drshti, focus, chosen part of the world to take into your senses. You must choose one that is steady, not too large or small and cultivate the ability to stay with it. You must know to reality of your chosen focus, or when it moves and reveals itself to be an ant you’ll be surprised and loose your balance! Paradoxically, perhaps, this means experimentation with an open heart and mind – without resistance or anticipation – and commitment to revising and refining your vision over time. Grounding happens where the rubber meets the road, or the skin meets the mat. In standing poses this means connecting through all four corners of your feet and feeling your toes relaxed and alive. This is the root or basis of the pose, and integrity here translates into integrity throughout your body. Off the mat, this can mean being transparent and realistic about our motivation and investment. Where does the rubber hit the road? How does a given activity, relationship or necessity really function in the context of your entire life? Where are your “feet” for this endeavor? Support comes from the expression of the pose through the entire body. In Warrior I, we often let the back leg become a little lax, after all we can’t see it and we’re so focused on the arms in the air and not falling over! Well not falling over is specifically influenced by how alive that back leg is! Even effort throughout all the limbs with the muscles gently huggging the bones and drawing into the core, even while we reach strongly out from the heart supports the overall expression of the pose, or any endeavor. Centering happens when we muscularly, energetically, emotionally, mentally hew to midline. Just as we draw our muscles to midline at the end of a meditative outbreath, centering requires that we draw our core support muscles into the center of the body. Core strength starts in the inner thighs, is felt in the pelvic floor and translates into the 3 major abdominal muscle groups usually associated with core strength, and even requires the finer muscles supporting the spine, connecting the spine and torso, all of which support the smooth and effective function of the diaphragm in respiration. Whether in yoga pose or traffic, find equanimity by bringin your awareness to your vision, ground, support & center. You’ll breathe more easily, think more clearly, focus more securely and choose with integrity you find it easy to follow through. Breathe, Balance, Be! Sensation – sight, sound, touch, taste, smell – the information we bring in from our embodied existence, makes up our being & life as much as the greens in our salad or the tofu on our forks. By using time on the mat to simplify and observe our sensations, we get to know ourselves better. We can recognize patterns in how we relate to this information, and even the systems we use to buffer it. One key when observing the role of the senses in my life is to note the double edged sword that is recursive consciousness. Recursive consciousness is this ability we have to have “second order mental events.” Mental events can be thoughts, ideas, concepts, feelings, emotions, whole stories even, or just attitudes towards first order senses, thoughts, emotions. Our ability to be aware of the fact that we are aware of something is precisely what gives us the option to be present. It’s also what gives us the option to “space out” or worry or plan or… do whatever we do that is not being present. We can event have eleventh order thoughts! Thoughts about thoughts about feelings about what-ifs about imaginations about …. you get the idea. The point where the thought or feeling has grabbed you by the intestines and you’re off to the story-telling races with the what-ifs and not-that!’s, that’s the stickiness that I’ve learned from listening to Pema Chodron is called shenpa. My husband & I love this word: it’s so economical. Rather than getting caught up in the stories when one asks the other “what’s up?” or “where you at?”, we just say, “oh! I was having some shenpa!” It’s fantastic to break up the story and bring us back to the present. What does this have to do with the role of the senses? One of the ways you can break shenpa – or unconsciously having thoughts about thoughts about… also called “living in your head” – is to come to the nitty gritty of our senses. What am I feeling right now? Seeing? Smelling? Hearing? Tasting? Feeling? You may have heard the word “Pratyahara” in yoga class at some point. Pratyahara – or sense-withdrawal – is one of the eight limbs, or components, of yoga . Sometimes the best way to investigate is to simplify. Short of a sensory deprivation tank – which is way cool if you ever have the chance – intentional withdrawal from sensation can be a great way to investigate how we relate to sensations. There are many ways to go about this, from simply turning off the TV or radio, to going to a quiet place like the woods or a chapel or a yoga room, to more specific withdrawals. Brahmari Pranayam is one way of experiencing pratyhara: you fill your consciousness with the vibration of your own breathing even as you close off your years, eyes, mouth and to some extent your nose. Meditation after Brahmari, or Bumble Bee Breath, can increase your sense of clarity. Yoga Sutra Conversations I.34: “The practice of breathing exercises involving extended exhalation might be helpful.” ~T.K.V. Desikachar, tr. I recently dowloaded and listened to a meditation course that was recorded during a retreat with the Buddhist Nun Pema Chodron, and I’m taking it again. She is endlessly kind and unflinchingly firm, difficult qualities to simultaneously embody. When I meditate, I’m also deeply aware that I’m trying to embody qualities that don’t always go together in my everyday life. Chodron is quite clear that meditation is training. Just like marathoners or weight lifters, meditators are training. Instead of watching TV and training to be consumers, cushion sitting geeks train for mindfulness. I like to think of her as coach, because just like my track running days, I now wonder when I’m in doubt “What would PC say?” instead of “Would Coach Bode approve?” Unlike my errant highschool days, however, I’ve internalized a number of PC’s ways of describing and relating, so I’m more likely to heed the advice. I used to wonder how much you could usefully say about meditation. I mean, it’s watching, right? So, um, watch. But of course the purpose of this observation is to become familiar with all the tricks you will use to squirm out from under the scope. And to become kind with the squirmee, because if you can’t be kind to you, it won’t be sincere with anyone else. And in this way, we might, with some luck, learn compassion. So instruction is endlessly helpful when it helps us catch ourselves before we’ve run too far amock. And one of PC’s standbys is to direct us to our outbreath. The instruction is to follow the breath, of course. But sometimes, the simple must be simplified, and for those times, Be Breathing Out. Two parts to notice: first, it’s not describe or control or think about breathing out. And second, it’s the exhalation. Now there seems to be some magic about breathing out. The Yoga Sutras are delightfully practical in giving us options for enlightenment: try this, & if not that, try this, and see how that works. The empirical nature of the Yoga Experiment is one of the reasons it works. It looks like self-improvement, so it appeals to the ego. But once you’re there, you realize that there is here and here is really the only place to be, so Be. Now why would breathing out be so magical? Proper exhalation is necessary to maintain the acid-base balance in the body, it’s the first line of defense, in fact. Exhalation has long been recognized an equivalent of letting go: witness, the sigh. Is there any more potent signal of surrender, whether welcome or overdue? And let’s not neglect the fact that what we’re dealing with are obstacles to self-knowledge. So often when frustrated with an obstacle of any kind, we push – emotionally, figuratively or literally. The last sutra gave us ways of meeting many things that look like “Others” in our daily lives – the virtuous and unvirtuous, the happy and unhappy. Here we are told that if discipline fails, it’s ok to just let go. Let the reins drop a moment. Exhale. Sigh. Release. Sure, there’s more to advanced pranayama and practices of Kumbacha, or retention. But as Sri Satchidananda points out, Patanjali isn’t writing a Pranayam Manual. It’s an enlightenment manual. How to allow yourself to be yourself in your day-in-day-out. Why you should care and why if you care you will train. And why, if you put in just a little bit of effort, your motivation will grow in ways you didn’t earlier forsee. Sometimes all it takes is one sigh, and sometimes, it takes exhaling over and over again, feeling it, being it. It depends on what you’re up to. But if you train in the over and over on the cushion or on the mat, you’ll be far more likely to remember to exhale when it really counts, just before those words you can’t take back spring from your mouth. Just one break, one gap, one pause between breaths, and obstacles can lessen or disappear. “I’ve been given the power to delegate 🙂 and so I do. I delegate: reading the newspaper to my boyfriend, big bosoms to some of my girlfriends, eating sugar to my kids, enjoying hunting to the hunters and giving the kids a cat to my ex. (at his house). What I get out of this practice, is SERENITY. If I really believe we are all one – than I truly can enjoy soo many things. If there was any doubt that yoga is more than what happens on the mat, here’s the antidote. The first time I heard this quoted, I wrote it down and soon thereafter was digging in the Sutra like it was a life raft. Sounds so simple: be friendly to happy folk, compassionate toward unhappy, take joy in good action and try not to get to het up about the bad stuff. Yoga is about the path, the everyday, every breath, every moment, what am I getting so excited about, where’d all my energy go, what’s it all about and how do I figure it out path. Simple is not easy, though. I wrote this on the clipboard I carry everywhere at work and when I felt my heart skip or my dander rise, I’d look at it. So much of behaviour is reactive and what this Sutra asks us to do is choose how we respond. Don’t react, respond, and do that with consideration… for your own peace. One of the things I admire about the translation above from Mukunda Stiles is that where other translators state these responses will bring us peace or quiet mind, he states they reduce obstacles to self-knowledge. In Sanskrit, the claim is “Citta prasadanam” which has overtones both of purification and calmness regarding the mind. “Lessening obatacles to self-knowledge” reminds us we are discussing the path that leads to yoga, which happens in the mind that isn’t identified with its disturbances. We can, little by little, step away from all our identifications, the things we act like matter even when we would say they don’t if asked point-blank, but we react to them as if they were everything, and so make them into our world. Peace comes from self-knowledge. In such a state we are transparent to the truth of our own being. How to reach this state? Start taking the veils off the dancer: the obstacles to self-knowledge must fall. But like any drunken reveller, when the veils start to ripple and fly we want to get caught up in them: Ooooo, look at how they catch the light! look at how they ruffle over the surface! smell how they catch the heady scent! We forget that the veils aren’t what they cover over, or we tire of the effort steady abiding, and we settle for the ruffle and sparkle, running off in the direction of the wind. In this sutra we are aksed to tend to our own responses to our worlds and in return, the world to which we respond will reveal itself as different than we’ve previously experienced. Not sure changing the world can be so simple? Try it. Practice your equanimity when buffetted with derision or insult. Practice being undefended and friendly when you are around happiness. Practice being undefended at all. Undefended and compassionate in the presence of Sadness? How do you keep your heart open and your boundaries clear? Yoga is a razor’s edge and you walk it with your heart. When you truly open your heart in experience, the world you experience transforms, and so do you. Where to start? In your next human interaction, your next breath. Heck, have you practiced compassion and undefendedness with your own precious self? Be friendly toward your own happiness, befriend and cultivate it. Have equanimity when you catch yourself in bad behaviour – no self-derision, no guilt. Steadiness, abiding breath and choice, whether in line or Ardha Chandrasana, these are the things that build our practice. Going to Yoga workshops is one of my dearest pleasures. I use them as rewards, treats, carrots and sometimes just fun. That’s why I’m excited to announce the first of this year’s YogaEveryDay workshops, my chance to share a concentrated yoga experience with you! Intro to Yoga on Saturday 31 January will focus on basics. Like a parent who secretly favors one child, my favorite classes to teach are the “Level 1”, “Basic” or “Beginner.” This Workshop will be an afternoon to learn or return to basics of alignment, breath, strength & opennes. Affordable, Supportive & Fun – Join Now! Partner Yoga on Saturday 21 February: we’ll provide a safe, open, light environment for practicing yoga poses in unique, supportive combinations that will open and enlighten your heart and connections. Join Now! You might be thinking, “It’s New Years! It’s time to improve and strive and make plans! It’s time to loose weight, stop smoking, make a budget, exercise more & eat healthier! Those are the five most popular New Year’s Resolutions, after all. What’s all this talk about contentment? Contentment both grows from and fuels practice. Yoga is an empirical endeavor. All the theory in the universe doesn’t matter at all if a posture disturbs you, or tweaks an injury. Our time on the mat is an experiment in awareness, breath & embodiment. Practice gives us freedom to explore the relationship – or simply enjoy it! – between our body, breath & mind. Observing our breath as we work with opposing forces, muscularly, structurally and maybe even emotionally, gives us feedback about our mind & our relationship with the world. We adjust our posture, and maybe even sometimes our lives, accordingly. As an experiment in breath-body-mind interaction, it is important to have clarity about what is the case before we start off into fantasy. Clarity can feel intimidating, perhaps even confrontational if there’s something on our mat we think we don’t want to see. Contentment comes not from satisfaction with whatever we find, nor from images of what we think we’d like. Contentment comes from realizing that what we want comes through acknowledging what is. Contentment is not magic, nor is it part of the self-esteem movement. Acknowledgement of what is – called Radical Acceptance by Tara Brach – brings us into the present moment. Investigation of what is brings us into this breath, how our body feels in this moment, and where in our body we feel a particular condition. The present moment is not a measure of time, which we know because of how our emotions effect our perception of time. The present moment, the Now as Eckhart Tolle dubs it, is always utterly unique in content but identical in form: it is timeless. This is our key to universal consciousness, always with us, never separated but not always acknowledged. Aristotle, a yogi of a very different tradition, noted as the very foundation of his ethics that happiness is most reliably achieved not by aiming at happiness, but by participating in activity with full engagement. And his teacher, Plato, noted that all beings desire only happiness, we are just frequently deluded about what will bring us happiness. Since Resolutions are all about what we think will bring us happiness, perhaps it is wise to start with contentment on the mat: come to the mat, be “just as we are” and find out about that being. The intentions we plant spontaneously in that present moment take root in a far more powerful place than our daybooks or blackberries can capture.